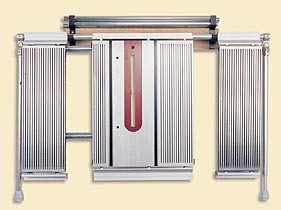 Mark 7 or Mark V model 510 / 520 Table System when you're not using it. If you like being organized and believe that there should be a place for everything and everything should be in its place, this table storage system is for you. Carefully engineered for strength and convenience, the rugged, extruded aluminum Brackets will store your worktable, two floating tables, four connector tubes and a pair of telescoping legs out of the way when not in use. Just mount the two brackets to a piece of scrap stock (not included), attach the assembled system to the wall at a height that's comfortable for you - and you're done. Nothing could be simpler! The four connector tubes drop right into the open top of the upper bracket arms. 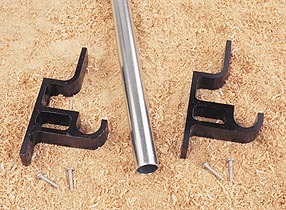 Slide your worktable onto the 45-inch long mounting tube (included) and hang it over the lower bracket arms. Then slide on your two floating tables and telescoping legs. Includes: • (2) Corrosion-Resistant, Black Anodized Brackets • 45-inch Mounting Tube • (4) Mounting Screws and • Full Instructions.